Finally a disc brake upgrade for your Camaro / Chevelle / GM A-Body / Nova that will work with your Factory 14 Wheels! Note: This kit will push the wheels out up to 3/8 per side. 1964 - 1972 GM A-Body Chevelle, El Camino, GTO, Tempest, Skylark, Special, GM A-Body Cars. 1967 - 1969 GM F-Body Camaro / Firebird. 1964 - 1974 Chevy II / Nova / Omega / Apollo / Ventura II. Pair of modified 5514 10 rotors - Vented for proper cooling. Pair of Cadnium Plated caliper brackets (watch out for non plated versions). Pair of single piston Cast Iron Calipers (from a Chevrolet Citation). Pair Rubber flex hoses (Caliper to Frame). Pair banjo bolts with washers. All necessary hardware (nuts bolts). NEW Gold Cadnium plated Show quality power Booster with Firewall brackets, rod and pedal hardware (everything you need to connect it to your pedal and firewall even on factory manual brake cars). NEW Dual bowl/Dual Ported Cast Master Cylinder with Gold Cadnium plated Lid. NEW Preset proportioning valve with low pressure warning switch. Master to prop valve lines, bracket and hardware. This kit is a simple install 100% bolt on! We offer Several Upgrades listed below with our kits: (Please see our other items). Stainless steel braided flex hoses - Replaces the rubber caliper to frame hoses. They are designed to give you a much firmer brake pedal which will give you better feedback and modulation. They will last forever and look GREAT! Chrome Booster, master and Prop Valve - Full chrome on the Booster, Master, Master Cap, prop valve, bracket and lines! We strongly recommend our Prebent hardline kit. Your factory hardlines will not work with ANYONES disc conversions so don't be fooled by their misleading ads for kits that come with 2 little lines they bent in their backyard! Do it RIGHT, get new lines from us that are MADE to work with OUR brake kit! Right Stuff Detailing offers Disc Brake Conversion Kits, Reproduction Steering Components, and Lines for Classic / Muscle Cars. Disc Brake Conversion Kits come in many different but similar styles: (Please make sure you check the item Title and Description carefully when ordering a kit to make sure you get all the components your project needs). Includes everything at the wheels to change from drum to disc brakes. Includes a Wheel Kit as well as a Master Cylinder and Proportioning Valve to manage the fluid to your brakes Required for Full Conversion (Factory Drum Brake Masters and Props do no work for Disc Brakes). Adds a Power Brake Booster to the Manual Kit (All Vacuum boosters require 18-22 of vacuum to operate correctly) Hydroboost Hydraulic Boosters. Are available for cars that do not produce enough vacuum for a standard Vacuum Booster. Front Only and Four Wheel Options available. We recommend narrowing the results by entering YOUR Vehicle's Year, Make, and Model in the "Store Search" area on the left. Thank you for shopping at Matts Classic Bowties. 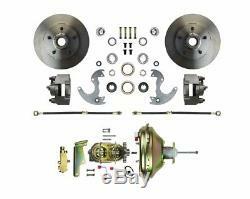 The item "Camaro Chevelle Front Power Disc Brake Conversion Kit Fits Factory 14 Wheels" is in sale since Wednesday, November 9, 2016. This item is in the category "eBay Motors\Parts & Accessories\Vintage Car & Truck Parts\Brakes". The seller is "mattsclassicbowties" and is located in Westerville, Ohio. This item can be shipped to United States.